Find sanctuary amid the majestic mountains of Asia! 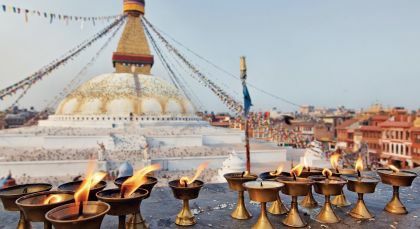 This trip offers all the delights of Tibet, from the spiritual bastions frequented by Tibetan Buddhists and historic Himalayan cities to glittering high-altitude lakes and Mount Everest – the tallest in the world. Break bread with locals, hike in picturesque locales and soak in the serenity at the once-forbidden mountain kingdom. Shigatse, the second largest town in Tibet, is next in importance only to Lhasa. Today Shigatse is home to the Panchen Lama, whose traditional seat is in yet another monastery in town – the Tashilhunpo. 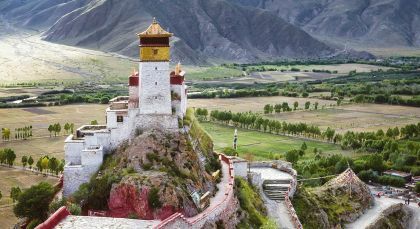 Discover fascinating landscapes and the beautiful Pelkor monastery on this trip from Lhasa to Gyantse. 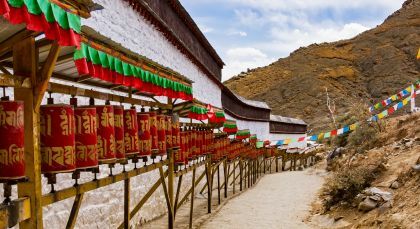 On your way to Tibet’s Rongbuk Valley, enroute from Lhasa to Shigatse, travel over numerous Himalayan passes, crystal clear lakes and snow-capped peaks. from the top of the Gampala or Khamba La pass, take in the panoramic view of the Yamdrok-Tso Lake and the snow white peak of the Nyenchen Khangsar, one the highest mountains in Tibet. One of the holiest lakes of Tibet, the Yamdrok-Tso is also called the Green Jade Lake, because of its deep turquoise shade and calm waters. Drive on to a still higher mountain pass, the Karo La, for stunning views of a gigantic glacier. Watch how the huge frozen mass nearly cascades down to the road to Gyantse. Once you have reached the quaint town of Gyantse, discover the Pelkor Monastery with its famous Kumbum. You’ll be awed at the sight of the gigantic dzong overlooking the city. Take a trip to the 9th century Sakya Monastery in the town of Sakya, enroute to Tingri from Shigatse. The town and the ancient monastic order take their names from the unusual shade of the earth in this part of the land. Learn from your local guide that the great Buddhist Master, Atisha Deepankara Srijnana, from Bengal in India, had prophesied the propitious site of the monastery. The Master was largely responsible for the spread of Buddhism in South Asia, especially to Tibet. Explore the centuries old Sakya complex with its numerous shrines, temples, and monastic cells. Admire the Tibetan Buddhist art and architecture of the complex that expanded over the ages. 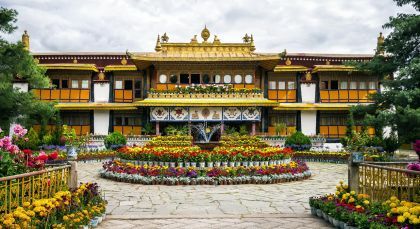 Established by Khon Konchok Gyalpo, it continued to be the seat of the venerable Sakya Order, headed by the Sakya Trizin, till the late 1950s. (Full Day, Morning Activity; Private Activity & Transfer; Fitness Level: Easy; Please bring comfortable walking shoes). This little town’s claim to fame is its convenient position along the Friendship Highway between China and Nepal. Also called Xegar or New Tingri, it offers an excellent enroute stoppage to the Everest Base Camp and back. Seize your opportunity of a lifetime to gaze up at the world’s highest peak from the Everest Base Camp! On your way from Xegar/ New Tingri, cross the famous Gawula pass that’s set high at 5198 meters above sea level. The famous explorer George Mallory passed through this on his way to the magnificent mountain. The region offers gorgeous views of five of the world’s tallest peaks, including Mt Makalu, Mt.Lhotse, Mt.Everest, Mt.Chowoyo and Mt.Shishapangma. Stop by the Rongbuk Monastery – the highest monastic complex in the world replete with intricate murals and architecture. The massive Chortens of the Rongbuk Monastery, set against the backdrop of the Everest with its singular peak, make for great photographs! Afterwards, take the shuttle bus or leg it up to the Everest Base Camp on the Tibetan side of the Sino-Nepal border. This area is fairly level, but you would be well advised to walk at a leisurely pace, considering the thin levels of oxygen here. Savor the moment that you encounter one of the planet’s most amazing landmarks, in blissful solitude. Following a simple yet deliciously hot lunch at the monastery or in the tented restaurant, drive back to Shigar or New Tingri. (Full Day; Private Activity & Transfer; Meal included: Lunch; Fitness Level: Easy, but mind the high altitude; Please bring comfortable trekking boots and don’t forget your camera). 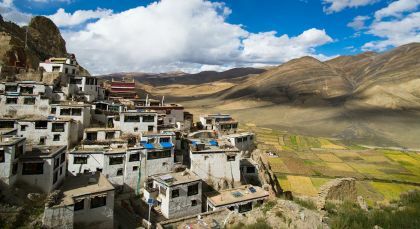 Tsetang is a modern Chinese city with a charming little Tibetan part of town tucked into a traditional corner. It is an important district capital and army base, set by the banks of the Yarlung Tsangpo River.